This article may not have sufficiently encyclopedic formatting or tone. 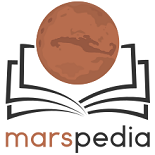 You can help Marspedia by formatting, editing, or reworking it. Details may change at any time. Please remove this template when it is fully developed. The cost of lifting items from Mars could become considerably less than the cost of lifting them from Earth. Low Mars orbit, at an altitude of 100 miles, has a velocity of 3440 meters per second, less than half of the velocity needed to orbit Earth at that altitude, more than twice the velocity needed to orbit Luna. With reusable rockets built on Earth to use liquid methane and liquid oxygen, if the exhaust velocity is 3500 meters per second, there should be 36% of the take-off weight in orbit. With wings for a supersonic in ground effect landing in the 0.1 psi Martian atmosphere, the empty weight should be held to 30% leaving 6% of the take-off weight as cargo. There seems reason to believe that supersonic in ground effect landing is a significant problem, and that it should yield to the proper effort, resulting in an economic Mars surface to Mars orbit shuttle. Donald Campbell was killed on the 4th of January, 1967 when the "Bluebird K7" racing boat flipped over and disintegrated at a speed greater than 300 mph. The problem seems to have been longitudinal instability when high ground effect lifting forces acted on a center of lift that shifted rapidly with changing attitude. An ordinary wind tunnel by itself is insufficient for testing craft in supersonic ground effect conditions. A moving belt of caterpillar like treads on the bottom of the wind tunnel moving as fast as the gas in the wind tunnel could simulate the runway rushing past during landing. Having a belt of treads that are broad enough and move fast enough for the simulation would be expensive, but not as expensive as doing the testing on Mars. At least with only 0.1 psi of carbon dioxide needed for a simulation, it would not cost as much as otherwise to fill the wind tunnel with cold carbon dioxide. An alternate wind tunnel design would be a torus or hollow donut shaped wind tunnel to be made with the donut hole having a one kilometer radius. It should contain a ring in a track along the wall closest to the center of the donut hole. This ring should be electrically accelerated to 450 meters per second and supported in its track by a film of high-pressure carbon dioxide. Model aircraft can be supported in such a wind tunnel by this ring and experience the effects of supersonic ground effect. The radial acceleration needed to hold the models in circular motion would be 20.7 gravities. The portion of the ring not supporting the models would be weighted to balance loading radially with respect to the center of the donut hole. Gas added to the wind tunnel by the carbon dioxide bearings would be removed by vacuum pumps. Landing at a speed in the neighborhood of 1000 mph (450 meters per second or mach 1.9 on Mars) might seem more difficult than the feat accomplished by "Thrust SSC," but moving through only 150th of the gas pressure (100th of the density) more than compensates for the increased speed. Maintaining lift and orientational stability are the problems for which we have aeronautical engineers, computational fluid dynamics, and wind tunnels. This page was last edited on 17 December 2018, at 13:05.